My First FMQ!!! | sew. quilt. explore. | modern quilting | tutorials: My First FMQ!!! So I have tested my FMQ skills on lots of test sandwiches and even have completed about half of a queen sized donation quilt, but I have never trusted myself enough to actually FMQ a quilt that I truly love. Until now. 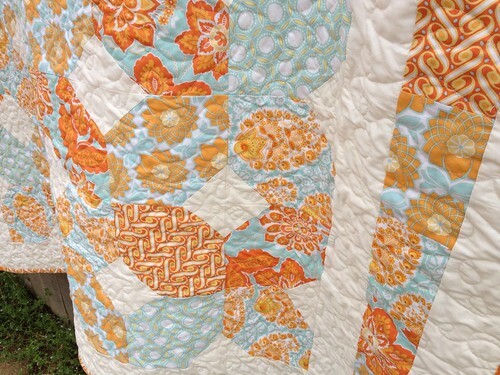 This quilt is made out of Joel Dewberry's Heirloom collection. I bought a couple of yards as soon as it came out, I LOVE this collection! I tried to go to sleep that night but couldn't, so I went up to my sewing room about 1:30a and cut out and "designed" this quilt. I say that loosely because I did not follow any pattern or see anything like it before, but after I made it I saw several that were similar, so I'm not going to infringe on their design, but I swear I came up with it on my own! When I was deciding how to quilt it and had gotten the nerve up to actually FMQ it, I realized I hated the way stippling looks, sorry if it's your favorite but I just don't like it. I'm a loopy kind of girl. So that's what I went with. I did meandering loops all over the center and then loopy lines on the borders. I had a couple of mishaps, but this was my worst one, not too bad, just set me back about 15 minutes. Overall it took me probably about 2 hours to quilt this lap sized quilt. I love how quickly you can finish one doing it this way!! 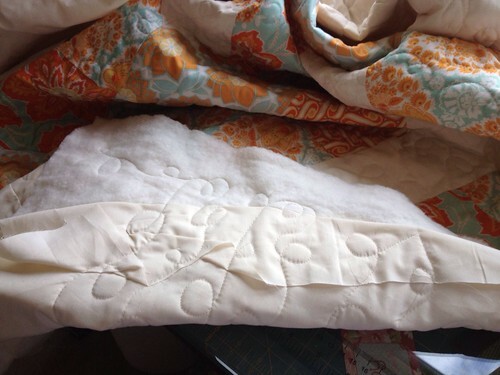 I love hand quilting but as I have been hand quilting my best friend's wedding quilt for about 6 months now, and the wedding has already passed and I'm still not done, I can see the benefits of machine quilting. Here's a close up of the quilting that I did. And here is the finished quilt! This will be for one of my best friend's from college who is getting married this weekend. It is in the washer now and when it gets out I will embroider the To:/From:. Oops I forgot to do that before.. It looks great Colby!!! And don't worry - we've ALL made those kind of mistakes! Way to go girl! Awesome job on the FMQ. The quilt is really wonderful too! Lol the quilt! The FMQ is awesome!! It looks fantastic!!! I have been dying to try one, but I am scared. Thanks for giving me the inspiration to go ahead and give it a try!!! Colby, it is simply lovely! Congrats on FMQing a quilt that you really love. That takes guts! I so do like your quilt! 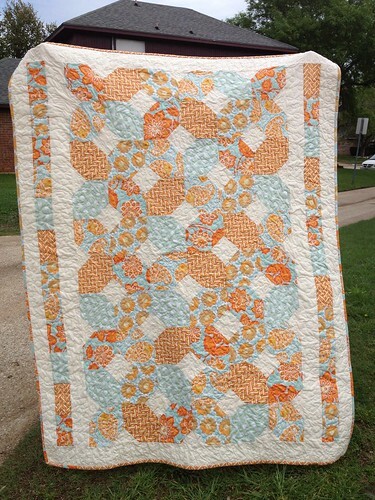 The colors are beautiful and the quilting is very good. I can see why you just had to have that fabric - I love it too! 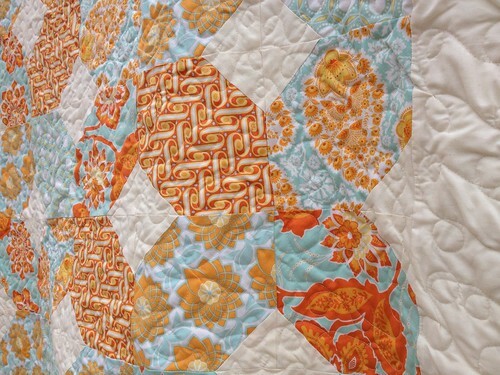 You have created a very effective colourway here - the quilt is absolutely divine - well done! And good luck with the hand quilted gift - you'll get it done! Congrats! I'm just learn FMQ too and I am scared to try it on some thing important. LOVE IT!!!!! Wish it was mine!